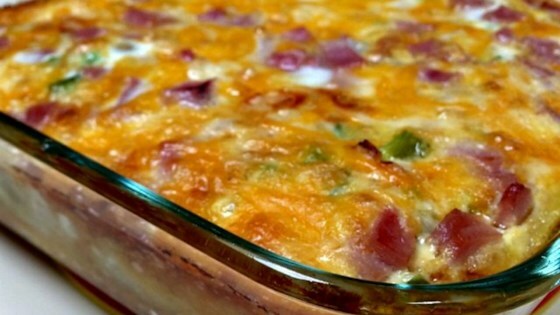 "Quick and easy breakfast casserole." Arrange hash brown patties on the prepared baking dish. Sprinkle Cheddar cheese and ham over patties. Beat eggs, milk, salt, and mustard in a large bowl using a whisk; pour over ham. Cover baking dish with aluminum foil. Bake in the preheated oven for 1 hour. Remove foil and bake until edges are golden brown and a knife inserted in the center comes out clean, about 15 minutes more. Substitute 2 cups bacon or sausage for the ham if desired. Great for dinner! Add diced tomatoes and onion for a nice alternative. My husband loved it! I used roasted potatoes and ham left over from christmas dinner. It was a hit! My family loved it. I will make it again and maybe add broccoli. I made only one small change.... BACON!!!! Didn't have hash brown patties, so I used a bag of country style hash browns with peppers and onions in it, was delicious. Very easy to make. Will definitely make again.